How many dinosaurs can you catch? Roll the Dino Hunt Dice and see! In this quick game for parents and kids, you\'re capturing dinosaurs for your zoo. Roll the dinosaur picture, and you caught him! If you get the leaf picture, the dino is hiding, and you can try again. If you get a footprint... you\'re STOMPED! Push your luck to catch as many as you can, but stop rolling before you\'re stomped three times or else you\'ll lose them all. 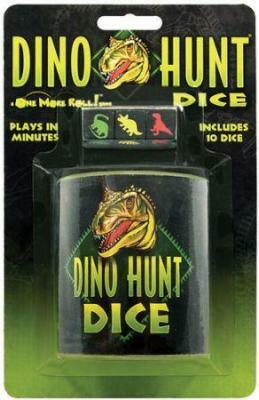 Dino Hunt Dice is a game for 3 to 8 players. Each game takes 10 to 20 minutes and can be taught in a single round.